The following is a reprint from Unwinnable Weekly Issue Eleven. 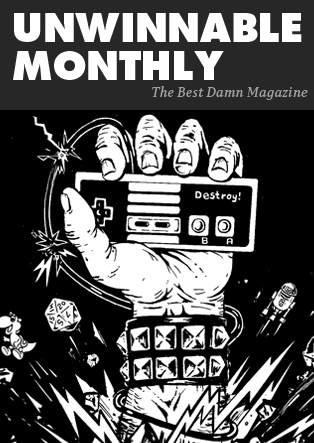 If you enjoy what you read, please consider purchasing the issue or subscribing for the a month. Twin Peaks is the greatest television show of all time. If you haven’t seen it, go pick up the brand new Blu- Ray box set and watch the series now. Do it twice. 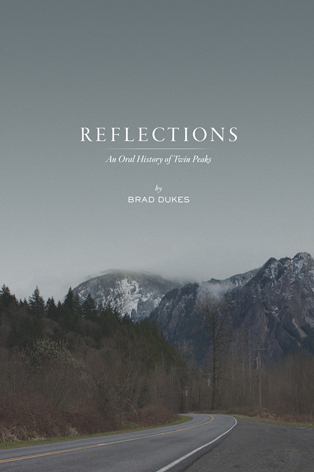 When you’re done, you’ll be ready to read my interview with Brad Dukes, the author of Reflections: An Oral History ofTwin Peaks. It’s a fantastic book on the series that’s fresh off the presses, and it’s a must-read for fans. Go ahead, Brad and I will wait. Unwinnable Weekly: I didn’t discover Twin Peaks until grad school. Meanwhile, you’re a little younger than I am, and yet you watched the series as it aired. Tell me what it was like to see the show through a nine-year-old’s eyes. Brad Dukes: I hate to be dramatic, but it was very life-altering. That first season was so captivating, even if a lot of stuff went straight over my head. But, the mystery of who killed Laura, along with characters like Agent Cooper and the Log Lady, drew me straight in. My mom and I still laugh about the fact she let me watch it. I met one of my best friends to this very day on the playground when we were talking about Waldo the myna bird being shot. I would even draw out scenes in my journal at school, but unfortunately they are lost. When the second season kicked off, it really terrified me. Instead of heading straight to my playroom after school, I stuck a little closer to my mom in the house because I was so freaked out. When Twin Peaks moved to Saturday nights, it left me with a lot to ponder the next day in church. Once the killer was revealed, my mom cut me off and I resumed my normal television watching with stuff like The Simpsons and the World Wrestling Federation. I didn’t find the guts to watch it again until I was a sophomore in high school and stumbled upon the VHS box set at the mall. Unwinnable: So you went from a boy to an adult and finally to a scholar of the show, and one that has met so much of the cast and crew as well as diehard fans. How has the experience of Twin Peaks evolved for you? B.D. : Twin Peaks has grown into a significant and bizarre presence in my life. I have very close friends that I’ve met over the years at various fan festivals and online discussion boards. We have a common interest and that branches out into other things. After interviewing over a hundred folks that worked on the series, I’ve grown close to a small handful of them as well. I talk to Richard Beymer [who played Ben Horne in the series] pretty often, which is hilarious because he refused to do an interview with me for years. When I sit back and think about it, I’ve made countless wonderful friendships along the way and we’ve all been on some pretty fun adventures together. Unwinnable: How many times have you watched the series? What have you noticed or discovered with repeated viewing? What do you skip, if anything? B.D. : I really couldn’t tell you how many times I’ve seen the series. I do enjoy watching it with other people who haven’t seen it, because it’s so fun to see what they react to. And they all react to something different. Leo, Nadine, BOB…take your pick. They all freak someone out! I like the Windom Earle story line, but I’ve probably watched Episodes 23-27 less than everything else. The Annie Blackburn stuff is probably my least favorite material of the series for varying reasons, so that’s probably why. Although, I do love the diner scene with Cooper, Annie, Gordon Cole and Shelly in Episode 25! Unwinnable: So, the book. First off, I loved it and obviously it was a great labor of love for you. The breadth of your interviews is astounding; when Miguel Ferrer (FBI Agent Albert Rosenfield) mentions Gavin de Becker, a childhood friend who helped inspire his character, that friend’s voice is the next one you hear in the book. How many interviews did you do and, over the three-year period you were conducting them, how much of your life did they consume? Did you quit your day job? B.D. : All in all, I think I talked to around 110 folks or so. They were either with the cast, crew, ABC or the music side of things. With one exception, I suppose. I avoided speaking to anyone without a direct connection to the show. There were over a dozen people I couldn’t even fit in the book! Aside from conducting interviews, transcribing them and editing it all into a narrative, I had to find (and convince) all these people to talk to me. That was a different journey entirely. I maintain a nine to five job, so evenings and weekends weren’t always fun and relaxing. I definitely conducted a few phone interviews on my lunch break in my car with a broken air conditioner. Luckily, my wife is one of the most patient and supportive people in the world, so she dealt with the ups and downs with me. I must say it was a roller coaster. A lot of the big names in the book either told me “no” or ignored me when I first approached them, so it was pretty thrilling when they changed their minds. I saved all the rejection emails for motivation. Unwinnable: He’s not interviewed in this book, but director David Lynch comes across as the main character, brought to life through the words of the cast and crew, especially in chapters like “Jimmy Stewart on Acid.” I assume you tried to get in touch with him as well? B.D. : Yes, I did. First, I must say, I could not have done this book without the support of the other co-creator of Twin Peaks, Mark Frost. Mark personally referred me and the book to David. At first he was “receptive” to the idea, but quickly cooled off. A few months down the road, I sent him a list of who I had talked to and a couple of sample chapters, but he just would not budge. I will make another edition of the book someday and I will give it another shot. Unwinnable: Besides Lynch, who do you wish you could have interviewed for this project that you weren’t able to? B.D. : Frank Silva (Killer BOB) sits at the top of that list. I can’t even wrap my head around talking to that guy on the phone, or let alone being in his presence. It’s a great sadness that he passed away nearly 20 years ago. I think he would be up at the Twin Peaks Festival every year near Seattle hamming it up with everyone if he was still around. I was able to talk to a few cast and crew members that were close to him and to hear a few stories of his everyday life was pretty intriguing. I would have loved to talk to David Duchovny, but his “people” refused to pass the request on to him. I must have called them over 25 times, emailed them a dozen more times, and nothing. That was probably the most frustrated I got during this whole project. Also, I am a huge, huge Leo Johnson fan. Especially the first season. It’s a very Frank Booth-ish character, and it pains me to have never found Eric DaRe to talk to him about bringing that character to life. Unwinnable: Richard Beymer talks about eating baguettes with Brie and butter with David Patrick Kelly (who plays his brother Jerry) in the opening scene of Episode 2. He says Lynch kept pushing him to talk with more and more food stuffed in his mouth, but he ended up at only about 65% of what Lynch was looking for. For me, that was a great story, especially because it’s arguably my favorite scene in the entire series, the perfect introduction to the Horne brothers and their gluttonous pursuit of physical pleasure. That’s just a very long way of getting to my question: What is your favorite Twin Peaks moment, and what did your interviews reveal to you about it, if anything? B.D. : There are so many, and it’s hard to pick one…but the revelation of Laura’s killer in Episode 14 (hope that isn’t spoiling too much) is one of those moments that will never, ever be topped in my book. The sheer sense of terror and shock is disturbing by any measure. I still don’t know how they got that on the air. I was lucky to talk to most of the people who were instrumental in that scene, and talking to them about it was quite grim. The tone in their voices was very serious and it drained everyone on the set. Makeup artists, assistant directors, the actors – they were all wiped out both physically and emotionally. Unwinnable: Obviously, you touch upon ABC’s lukewarm support of the show heading into the second season, the move to Saturday nights, the pressure to reveal who killed Laura Palmer and the absenteeism of Lynch. Do you think the network was trying to kill it? How do you think the show would be treated today, and how would Twin Peaks, Season 2, be different? B.D. : ABC was in such a weird place at that time. Bob Iger took over the network between the filming of Twin Peaks’ pilot and its pickup as a series. From what I understand, Twin Peaks would not have continued from there without his support. I don’t think they expected 35 million people to go nuts over the pilot, and the masses were upset about the mystery being drawn out into the autumn. However, it was such a media darling that there was no question to renew it. Fox was even primed to pick it up if ABC had cancelled. Where were they the next year?! Ha. I don’t think ABC wanted to kill it with the Saturday move. China Beach (another critical darling) was moved there as well, but I think ABC knew they were taking a huge risk and were not going to lose sleep if it didn’t work out. Seriously, what else was on Saturday nights at the time? The Golden Girls and The Love Boat. I also think Twin Peaks may have dug a hole for itself when they did not film the first season finale script they submitted to the network. Today, things are just so different. The golden age of distinguished television is in full bloom and I think everyone (studios, networks, and creators alike) learned a great lesson from Twin Peaks. Now, intricate storytelling is usually confined to 10-or- 12 episode seasons and they have a set destination, leading to something else. Twin Peaks had that in the first season, and that sort of continued until the killer was revealed. Once the show lost sight of a destination, it spun out of control…it’s just too bad a provocative enough question wasn’t posed before the grand revelation. I still don’t get why the true nature of BOB and whatever lurked in the woods wasn’t pulled into focus more quickly. I think abbreviated seasons would have helped Twin Peaks greatly, to give Lynch and Frost time to figure out complex threads thatare deliverable to a big audience. How many television shows run a demanding and taxing 22-episode season? Notice Lost couldn’t keep up with that pace, but that’s another discussion entirely. Point blank to answer your question, networks now seem to give more creative latitude to these ambitious shows with the caveat of a firm destination. Unwinnable: Bob Engels [one of the Twin Peaks writers] told me Major Briggs would have played a central role in Season 3. Did you gather any insight into how a Season 3 may have played out? B.D. : No, not quite. Harley Peyton and Bob Engels didn’t have much to offer in that regard, but it seems like the consensus was to resolve the Cooper/BOB cliffhanger and then do a “time jump” a few years later. If Twin Peaks were to be brought back, I would like to see a mix of those, as in how True Detective worked its narrative. Unwinnable: We met at the Twin Peaks Fest in North Bend, WA, in 2012. How many have you been to? Any favorite moments or memories? B.D. : It is very tough to top my first festival. Aside from always meeting new and interesting people, it’s great to reunite with the regulars as well and catch up. The costume contest is always awesome – and you, Matt, had one of the best of all time a couple of years ago. Go ahead, post it in this article! Unwinnable: Visiting the town of North Bend (and the surrounding area) is a pilgrimage all Twin Peaks fans should make. Lynch and Frost say stumbling upon it during location scouting was serendipitous. It’s definitely a character in the show – if not the star of it. What makes it so special to you? B.D. : It just feels like a magical place. Snoqualmie Falls is such a breathtaking sight – it just never gets old. Driving around at night and going to some of the locations in the woods is a real trip. A lot of interesting nooks and crannies in that area. And of course, there’s some great places around, like Poulsbo Island, and the houses of Donna and Laura that are north of town [in Everett, WA]. Lynch and Frost really had an eye for personality with those locations. Unwinnable: There is a vocal group on the Internet that wants to see the show revived. Are you in that group? Do you think it’s inevitability in some form, with all the recycling being done these days in entertainment? B.D. : As much as I love Twin Peaks, I think it should be left as it is. The series was the collective effort of a lot of important people, not just David Lynch and Mark Frost. There was Bob Engels, Harley Peyton (who wrote a big share of the episodes), not to mention a ton of wonderful directors and a host of brilliant actors. And the music. I know Angelo [Badalementi] composed and orchestrated the music, but there were other musicians in the mix that helped bring it to life. I don’t really think you can capture the total essence of Twin Peaks without all those people. The thought of someone else other than Frank Silva playing Killer BOB is also pretty awful. You might think it’s inevitable, but David and Mark own the property of Twin Peaks and I don’t see it continuing in another medium without the full support of both parties. I definitely wouldn’t want anything less, especially after studying the show to the degree I have. Even if you’ve got John and Paul, it’s still not The Beatles. Unwinnable: What’s the legacy of Twin Peaks? Will it be remembered in another 25 years? 50? 100? B.D. : I think of Twin Peaks as The Velvet Underground of television. There was a limited run and a cult audience, but over time it inspires people to make their own art. Twin Peaks will live forever, and I think people will continue to discover and rediscover it for the remainder of civilization as we know it. It wasn’t apparent in 1991, but Twin Peaks set a standard for what makes and breaks intricate episodic storytelling in television. All of the executives from ABC that I spoke to made that pretty clear in our conversations, whether explicit or implicit. Unwinnable: What’s next for you? Any other Twin Peaks-related projects? B.D. : I am in the thick of promoting the book, but I have a couple of big ideas I’d like to get to work on once things settle down in the fall, one being another book that has nothing to do with Twin Peaks, and something else in another medium that I’ve never tried before. Aside from that, yes, I think there’s going to be another Twin Peaks book. I literally have 400,000 words I couldn’t use in Reflections, and I’d like to piece together somewhat of a production journal that examines the more technical side of the series. That is a ways off, but I have a great head start on it. Follow Matt Marrone and Brad Dukes on Twitter @TheBigM and @Brad_d_ respectively.